One of the most-anticipated matches of the opening day of the Premier League season turned out to be a relatively low-quality affair as United ran out winners with a Kyle Walker own goal. This article focuses on the pressing games of both sides. Van Gaal started one of numerous big signings Memphis Depay in a central role as Manchester United lined up in a clear 4-2-3-1 formation. De Gea was controversially left out of the squad all together for the game as Sergio Romero started behind a back four of Shaw, Blind, Smalling and ex-Torino Darmian at right-back. Schneiderlin was another new signing to debut in the starting 11 as he sat in the left side of defensive midfield alongside Michael Carrick. In the attack, Ashley Young and Juan Mata were positioned on the left and right wings respectively flanking the promising Dutch forward behind captain Wayne Rooney. Spurs came to Old Trafford also in a 4-2-3-1 formation with some slight differences in the orientation of the players. Michel Vorm was the away team’s goalkeeper behind a back four consisting of Ben Davies, Vertonghen, new signing Alderweireld and Kyle Walker at right-back. Eric Dier had a somewhat of a surprise inclusion in the centre of midfield alongside the slightly more advanced Nabil Bentaleb at the left 6. Ahead of them sat Eriksen in the centre of a trio featuring both Dembele and Chadli whilst Kane was the lone striker at the top of the system. The game generally lacked quality throughout as neither team managed to get an expected goal score of over 1 as there were some issues in the possession games of both teams. In particular the positional structure of United suffered from the pairing of Mata and Depay. The Dutchman played in the role of a second striker behind Rooney and rarely moved out wide apart from some movements to the left half-space whilst Mata more familiarly looked to support United’s possession game coming in from a right-wing position. However during many scenes where the Spaniard came inside there was an issue in the spacing with very little distance between the two, making it easier for Spurs’ to defend against the two players who were in the same space far too often. From Michael Caley’s excellent expected goals analysis. Throughout the game, Pochettino’s side pressed ineffectively and caused them numerous issues which would’ve been capitalised on but for some poor play in transition by United’s forwards. Especially when pressing high into Manchester United’s own third they lacked co-ordination and rarely was a press effectively organised without issue. For the most part it was a case of a poor spatial compaction between the waves of pressing which United could easily use to quickly progress the ball up field with safety. One of numerous cases where Spurs lacked coordination in their press which ultimately failed as a result. Spurs pressed particularly poorly in the half-spaces where they consistently failed to develop any defensive access which was at times exploited well by the opposition. This was particularly evident on Manchester’s right flank where Mata came inside to support the possession game. The main cause for this defensive issue were typical of English football. 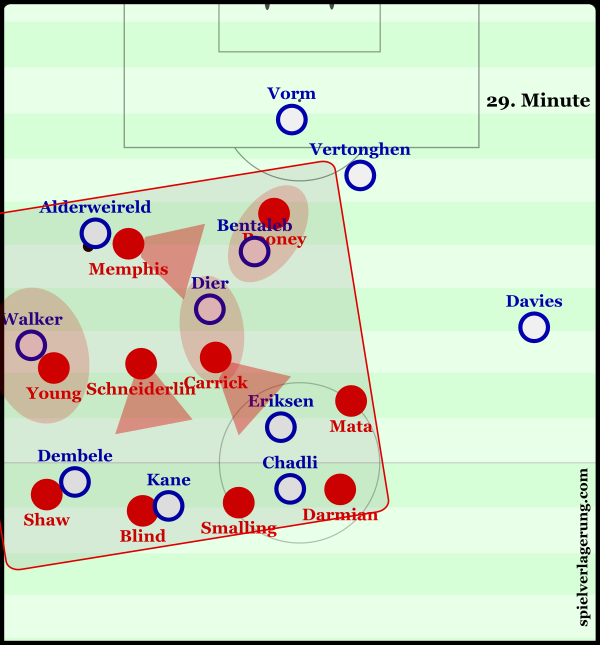 The primary issue for Spurs’ ineffective pressing attempts was that they lacked any horizontal compactness throughout the game, resulting in horizontal connection issues and big open areas in the half-spaces – particularly as the wingers were stretched. This issue alone was down to the man-marking orientation of the wingers as, like the majority of English teams, were oriented to the full-back with absolutely no variation in between. Although neither team exploited this to its greatest potential, there were a few moments throughout the game where the defending team lacked stability in the centre because of this. Another, slightly less significant factor was a poor level of ball-orientation collectively. This emphasised the compactness problems with little support close to the ball, resulting in a below-average consistency and level of defensive access meaning that the original uncompact shape could be more easily exploited. This wide orientation was a feature of both sides and was a defensive issue which occurred on numerous occasions throughout the match. By moving into a situational 6-man defensive line, a team will usually relinquish central control without the support of the wide players in the midfield which is the cause of a significant lack of security. In the case below, United lose defensive access to press Eriksen who unlocks the defense in an excellent diagonal pass, nearly resulting in a goal. Defending in a 6-2-1-1, United easily lost defensive access which resulted in a chance following a diagonal by Eriksen. In contrast, Manchester United were much more promising in their defensive strategy as they used a mix of direct pressing and partial pressing to direct Spurs’ possession into weak areas, where the home side enforced simple yet effective traps. 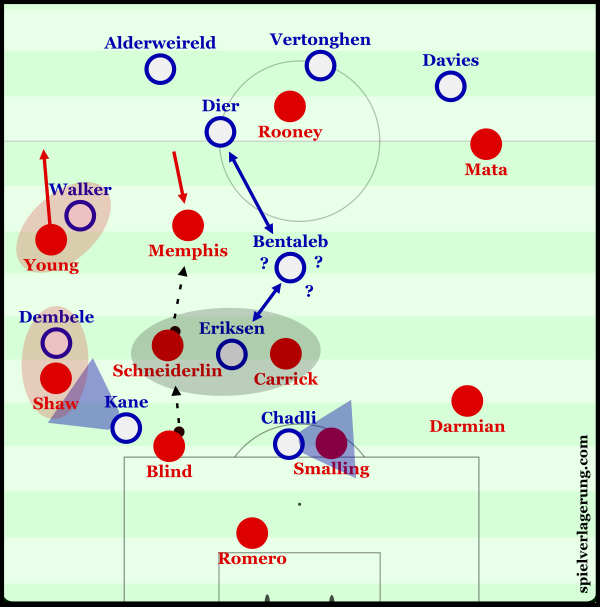 Using a flexible man-marking scheme which saw the two United 6s move quite high up the pitch in pursuit of their Spurs counterparts and they coordinated the press relatively well, considerably better than their London opposition. One of many examples of United’s intelligent movement to force the ball towards Spurs’ left flank. This was quite a typical scene from United’s pressing in the opposition’s build-up phase of possession. The positioning of Mata and Rooney forces Vertonghen to take an alternative route than down the left through Davies whilst Carrick ensures that Spurs must find an option other than the technically-superior Bentaleb in the middle of the pitch. 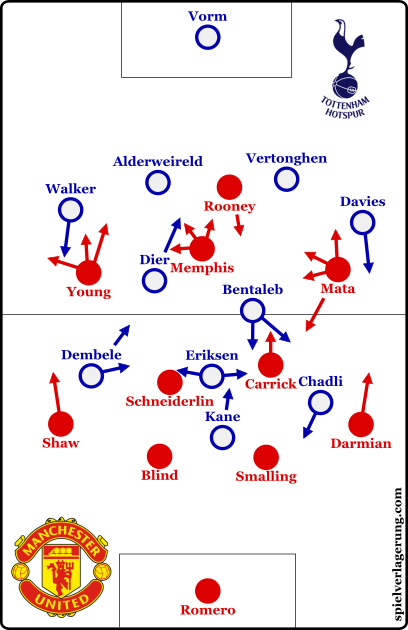 Within their man-marking scheme there was a particular focus on the Algerian and the likes of Carrick and Schneiderlin were more aggressive in their pressing of the number 6, coming further out of their original position than in comparison to the press on Dier. From this position, United forced Spurs to the left through Alderweireld who reluctantly drove the ball towards the touchline. Instead of pressing him directly, Memphis arcs his movement to block off the return passes to both Vorm and Vertonghen and later inside passes into Dier and Bentaleb who are both being marked also by Carrick and Rooney respectively. The final stage of the pressing trap. Once Depay isolated Alderweireld from bringing the ball inside and instead forcing him even further towards the touchline, United start the press with relatively good (this is still a Premier League match guys) preparation which allows for the necessary stability. 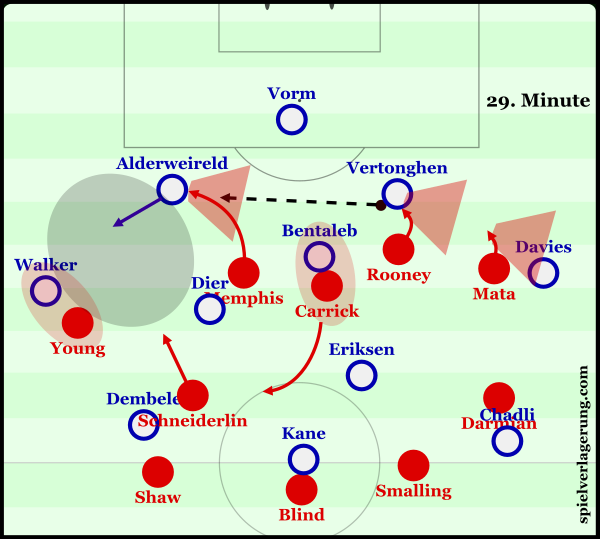 In the above scene in particular, Carrick is intentionally slightly withdrawn from Dier to create another trap as he regains possession following a pass from Alderweireld and United find themselves in a threatening position to transition from. 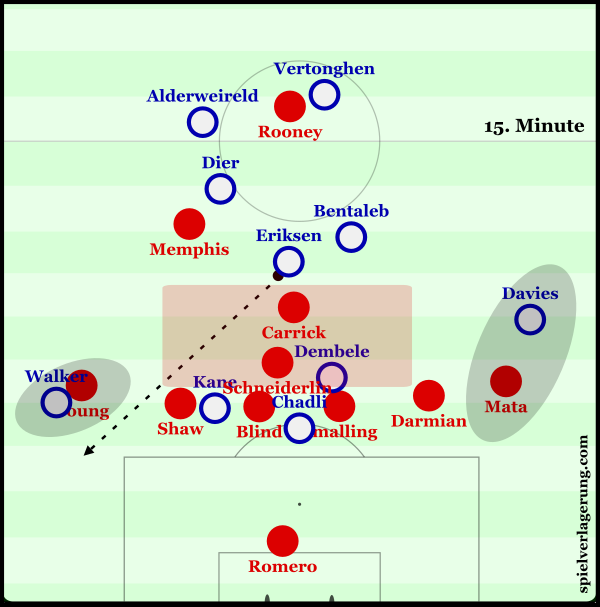 The pressing shape with both Carrick and Schneiderlin oriented to pushing high up the pitch situationally was somewhat unstable in the lines between the midfield and defence yet the opposition were more often than not unable to access these spaces where Eriksen was positioned. Considering that Memphis had the role of initiating and completing the trap alongside Rooney in the first line of pressure, it would’ve been interesting to see the effect which Eriksen could’ve had in the first phase of Tottenham’s possession. The Danish 10 would’ve been hypothetically able to create overloads amongst the first midfield line which, even if Memphis was forced to drop to restablish the balance in the midfield, would’ve prevented United from enforcing the above wide traps. From the aggressive shape on the right of the pitch, United were quite good in their ball-oriented shifts in order to maintain compactness and not become disorganised by the horizontal movement of the ball by the opposition. The shift of the midfield pairing were particularly effective as they were key in United maintaining defensive access throughout the organisation of the trap and crucially once Alderweireld had taken the ball towards the touchline. 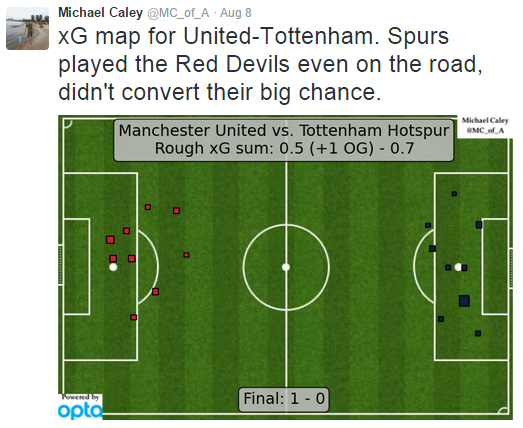 In reply to this strategy from United, Spurs looked to use long diagonal passes to the opposite flank. As I discussed in a recent analysis, one of the key aspects of diagonal passing is that it generally not only moves the ball from a well-defended area to an under-covered one but when the pass originates from the wing, moves it into a more strategically-valuable space. In this case however the strategy was largely ineffective due to a poor technique in the passing. When Alderweireld was making these passes, they were far too lofted and slow through the air meaning that United not only found it easier to intercept them but if they did reach their target then the defence will have had enough time to redevelop defensive access and perform an effective press on the new ball location. One of the only times this worked was late on in the 84th minute as a long diagonal from Spurs’ right resulted in a dangerous shot by Eriksen. The difference here was the pass was much flatter and faster to reach its target so United didn’t have time to react and shift accordingly. Thanks for this fine analysis. I took a few notes on the game, and noted United interceptions by Carrick in the 28th and 41st min, and Schneiderlin in the 35th min. I would like to go back and study these after how you laid out their press here so well. First, how they were set up to force Tottenham into the mistakes, and secondly, if they transitioned well after the interceptions. They broke well after the gift to Mata, but it is not something we see enough of yet from Man Utd.